I have one more Saarang (used to be Mardi Gras) related post before the cultural fest begins at IIT Madras in another couple of weeks. Before I begin to write about it, I hope you all had a wonderful New Year. I pray all your wishes come true this year. And so it was Mardi Gras in 1983. 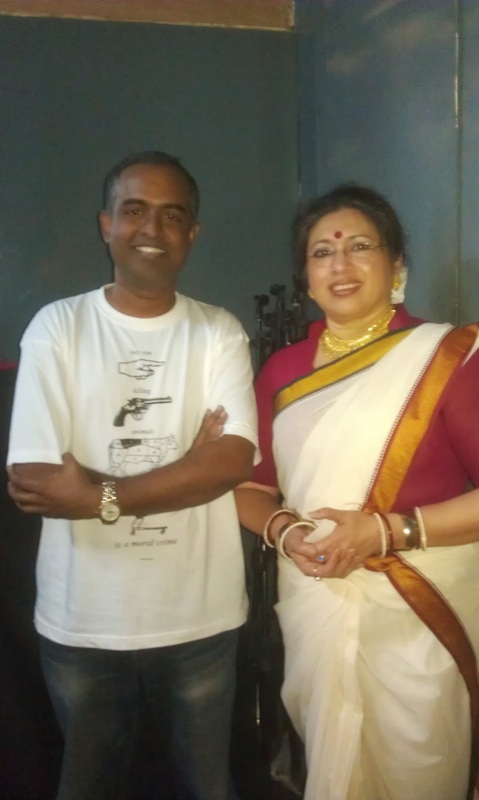 I was in the Xth Std at school and for the pro-show, Ananda Shankar and his troupe comprising his wife Tanusree Shankar and company were to perform. I went there with my brother, sister and parents and till date I can say that is was probably the best pro-show I had ever watched at the O.A.T, IIT Madras. The dances were unbelievable. I didn't know that there was someone (credit actually goes to Ananda's parents Uday Shankar and Amala Shankar) who could take all the dance forms of India and present the amalgamation in such a colourful, beautiful and delightful manner. For the first time in my life that I fell in love with Indian dance. To top it all was Ananda's incredible sitar-meets-rock fusion music that never lacked melody or that classical classical touch. For the first half of the show, dances were accompanied to music being played in the background. This probably went on for an hour or an hour and a half. There was a break and what we treated to for the second half was even more unbelievable. Ananda Shankar and his entire band were on stage, with the dancers performing in front of the band. The lighting was incredible for a show staged way back in 1983. Ananda and Tanusree would come a second time in the 90's but this time their music was more modern but there was no band on stage, nevertheless the dances were spectacular. After the passing away of Ananda Shankar in 1999 I was even told that the troupe's days were over. It was heart-breaking to hear from some folks who had been living in Calcutta too but that was far from the truth. Tanusree Shankar has only taken Ananda's dance company ever forward. On Monday I was fortunate to witness a short but lovely performance (not on the scale of the previous performances with Ananda) at the Kalakshetra in Chennai. It was also a privilege to have had the opportunity to have interacted with the legend herself and her dancers after the show. I did mention to her about the 1983 show and she was so excited to talk about it and about the green campus of IIT Madras. Tanusree choreographs most of the dances and also takes part in some of them. I actually couldn't help admiring her English too. I was given her card and will be writing to her. In fact one of the first albums I reviewed on my great-anonymous-albums.com website was Ananda's classic debut album. The link to the review is here. After taking her blessings I requested for a picture to which she gladly obliged. While leaving Kalakshetra I was only wondering what a nice beginning it was to 2014 when I have also planned my first trip to Mayapur via Kolkota. Will I get a chance to visit Tanusree and Ananda Shankar's dance Company? Let me see.